Thats my planned lift point. This is my signature - how do you like it? Chemist is correct on the first picture, however the 2nd picture is not the lifting point for the back, I will show the link to a picture of the lifting point, also notice I'd purchase the rubber inserts that Brentil mentioned a while back and you can get from BMW. I have to disagree - based on the pdf that is the LIFT point not the JACKING point. You are correct. My text in my last post refers to this as the JACKING point. The lift point is as you indicate. The little front ones you mention Chem are the lifting points, I'm still unsure where to jack from in the front. I am still not sure myself as to where GM thinks we should jack in the front. I jacked using the LIFT points. The tech sheet seems to inidcate that you should jack at the "knuckle" where the front suspension arm connects to the frame. You can get the "Mr. Goodwrench" jack under there from the front, but operating the lever to get the car off the ground is limited for the first 2-3 cycles. As Susan (I think ) mentioned, the cross member between these two knuckles should also be safe to use. I still maintain that two good PHOTOGRAPHS from GM would solve this whole thing. I think I'll email them here in a moment. EDIT: Just ran off an email (10:58 pm CST, 10/20/2006) to GM to ask for this very thing. I will post when/if I hear back from them. Last edited by Chemist; 10-20-2006 at 10:00 PM. This is also one of the major reasons (besides meeting lots of forum members), I want to go to the next National. I am hoping there will be a demo on lifting points and a Q and A session on modifications including how to. I looked at the pictures and chemists posts and am still not sure how to lift the car safely. The lifting points on the car have been already address by Chemist and myself, the question now is the Jacking points on the front of the car, this does not mean you could not try to use the lifting points as Chemist showed when he lifted the front. Shown below is an updated version of a prior post I made where I tried to make the distinction between "lift" and "jack" points. I have had the car up in the air a couple of times with all 4 wheels off the ground using this procedure. Over the weekend I took all 4 wheels off to clean them up for KC (as suggested by Turbo). At the rear of the car, the lifting instructions (linked in another post) identify rear jack points where the suspension linkages are attached to the frame cross member. The jack slides in easily from the rear and I placed it under one of the suspension linkage frames and jacked up the rear end. Be careful to not place the jack under the suspension linkage as you can lift the linkage while lifting the car. Jacking at one side will lift the rear of the car so both wheels are off the ground. You can then place jack stands under both rear lifting points using a single jack. The rear lifting points are easy to find with the slots in the frame and the recessed area in the body panel. I tried to purchase the GM lift pads from my dealer, but I was told that I could not buy service tools. I went the build your own route and purchased 1 ¼ inch OD screw eyes that were inserted into wood blocks. The wood block is 2 x 4 stock cut down to 2 ½ inch wide x 3 inches long. You screw the eye into the center of the block and the block sits inside the body when twisted into the frame rail. (Some Corvette sites talk about using hockey pucks with screw eyes.) The jack stands interface with the lift pad and you can safely work on your car and not worry about bending the body. The front frame slot does not have a body panel recess which leads me to think that it is not the front lift point. I remember something about this being a tie down location for shipping. My interpretation of the lifting instructions is that the front lifting point is located between the front frame slot and front wheel on an auxiliary frame pad that has two circles punched in it. This auxiliary frame appears connected to the main frame rail as it moves in from the front frame slot, in to the engine/front suspension mounting. This link http://www.corvettegarage.com/produc...-corvette.html should take you to a site with some anodized aluminum jack pads. They look nice but I decided to spend the money on other tools. Good luck with the tire change overs. This is a link to the another thread about lifting/jacking the car. Aggressive, Steel/Sand, w/ many options. I've got email in to GM for just that. We'll see what happens on Monday. 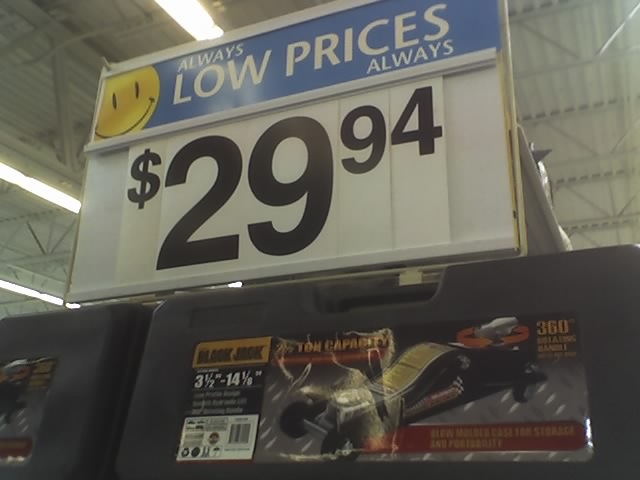 When I first rotated my tires, I drove the car up on Rhino ramps, then used the floor jack, then jack stands. What a pain. My jack Craftsman jack is 5 1/2" like many of yours. I was reading this thread and went to the store to buy a new low profile jack. Harborfreight.com has a cheap 5" jack for $19.99 and also has a 3 1/2" aluminum jack for $80. I was looking at these and was thinking "man, I really don't want to buy another floor jack. I already have a perfectly good jack..."
Then the thought occured to me. On my Craftsman jack, the round lifting part detaches, and leaves an approximately 2"x2" flat lifting area. This created a low profile jack. I tried it out and it just barely fits under the car. I'm talking maybe 1/16" of an inch, but it fit. I start jacking it up slowly and the jack arm would contact the body panel if I continued. I need to put that round lifting part back on, but it won't fit. Then I thought back to this forum. Somebody kept saying use a puck. Then I thought a hard hockey puck would work. It matches the front lifting point closely and there only a $1. The only problem is there's not enough room to shove a hard puck between the frame and the jack. I tried one of the soft rubber pucks and I was able to squeeze it in, but I had to rotate the jack to get it off the body panel. Soft puck plus the jack works, but the distance between the jack arm and the body is still pretty close. I pull into the garage and notice the 12"x12" 3/8" thick piece of wood I have for winter storage sitting on the floor. If I stack two of those, then drive on top, plus use the jack with the hard puck idea, this just might work. Well it does, quite well. 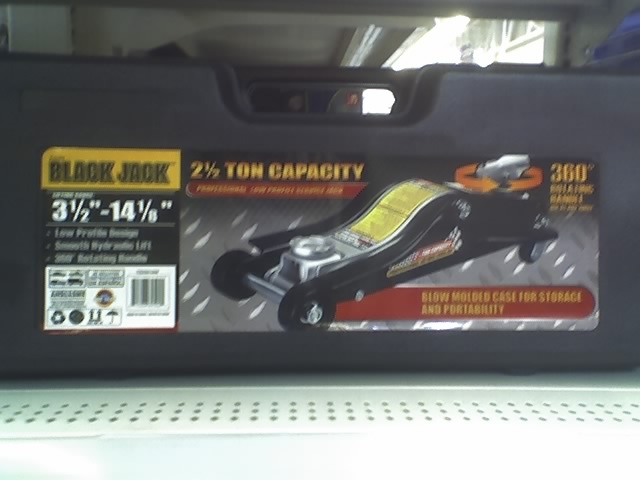 In fact, driving up on the boards lifts the car enough that I can use the orginal jack with or without the lifting part with plenty of clearance. Thanks to this forum and a little stretch of the imagination, I don't have to buy and store another jack. I tried this on the front only. I'll try the rear today. Last edited by BTYPLSR; 12-10-2006 at 09:42 AM. For the rear, drive on a piece of wood or similar material, leave the jack as is(don't remove the lifting part), then put the puck in the middle of the lifting part, and voila, you can lift the car. Just a word of caution, use this method only to lift the car, then place a jack underneath if you plan on crawling underneath the car.